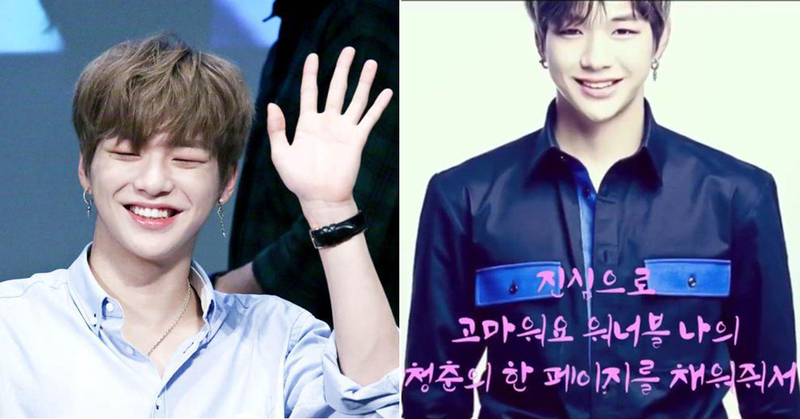 Today, December 10th is Wanna One's Kang Daniel's birthday. As of today, he turns 22 in international age. Fans have prepared billboards, banners here and there not only in Korea but also overseas such as America. Fans also donated to orphanages, colleges for scholarships and so on. This time, there is something Kang Daniel prepared for his fans. He made an approximately one and a half minute long video in celebration of his own birthday to express gratitude to Wannable. The following is an English translation of the Korean subtitles in the video. All the sudden attention was quite astonishing and difficult for me to deal with at first. But I had never thought I would be able to do anything like what I've done. I've had the honor to cover songs of the artists who I used to look up to and even performed them. A kid who used to like to play drums because of the beating of the heart is now old enough to play drums in a beer commercial hahaha. I started drawing because I liked to draw my own world. And now, there are people who say my drawings are artistic. I'm planning to share this blessing that I've gotten from with other people. There will be a surprising event tomorrow. So look forward to it! Thank you so much for filling in a page of my youth. Thank you for watching this video. Yeah!!! Despite the fact that the video doesn't seem to be high in quality as Kang Daniel mentioned himself in the video, the fans say that it is already sufficient for them to be moved. From the video, We can witness how much Kang Daniel thinks of his fans and how genuinely grateful he is for all the love and the opportunities he has gotten from the fans. Hope to see more of the supportive bond that Kang Daniel and his fans are going to develop even further!